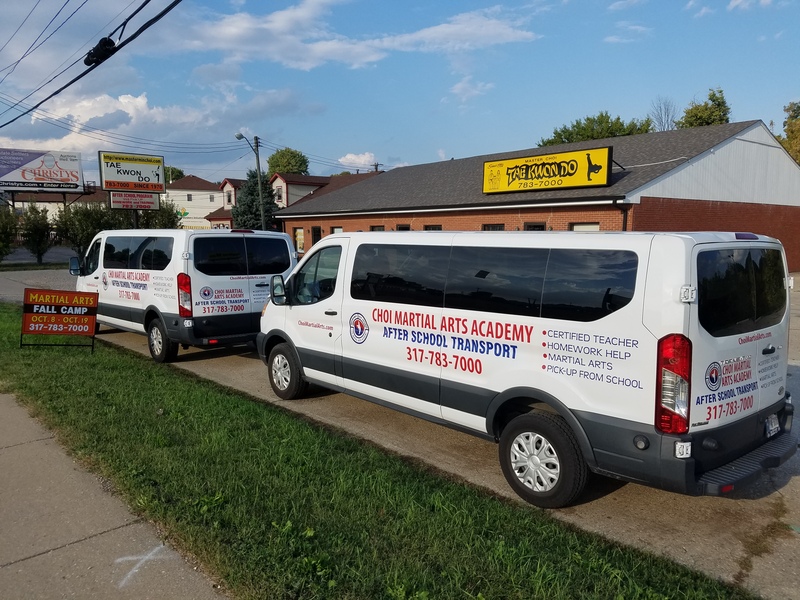 Choi Martial Arts Academy Transported Martial Arts After School Program is the answer for kid’s martial arts in Perry Township, Franklin Township, Greenwood and Center Grove! The day begins when your child is picked up from school by one of our qualified drivers in one of our safe fleet vehicles. When your kids arrive at the Academy, they will be greeted by an experienced school teacher and friendly Black Belt Support Staff. 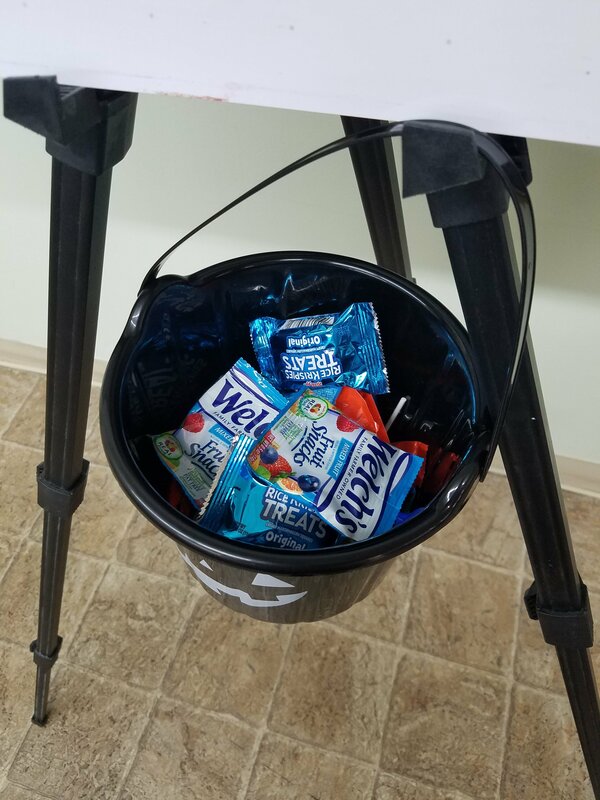 They will be served a healthy snack before doing homework and independent reading in our safe and clean facility. 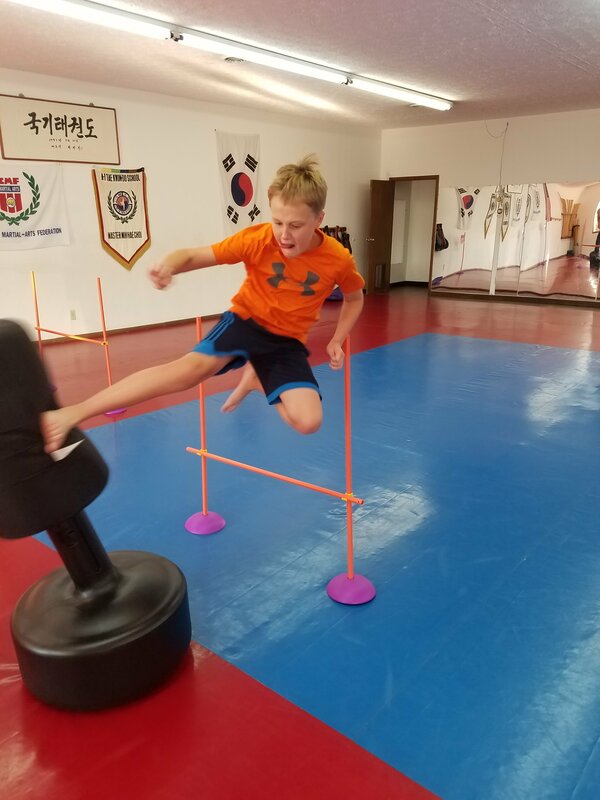 After homework help and reading, your child will participate in either an Early Martial Arts Class from 4:45 – 5:45 pm or a Late Martial Arts Class from 6 – 7 pm. You choose the class time that best fits your schedule! 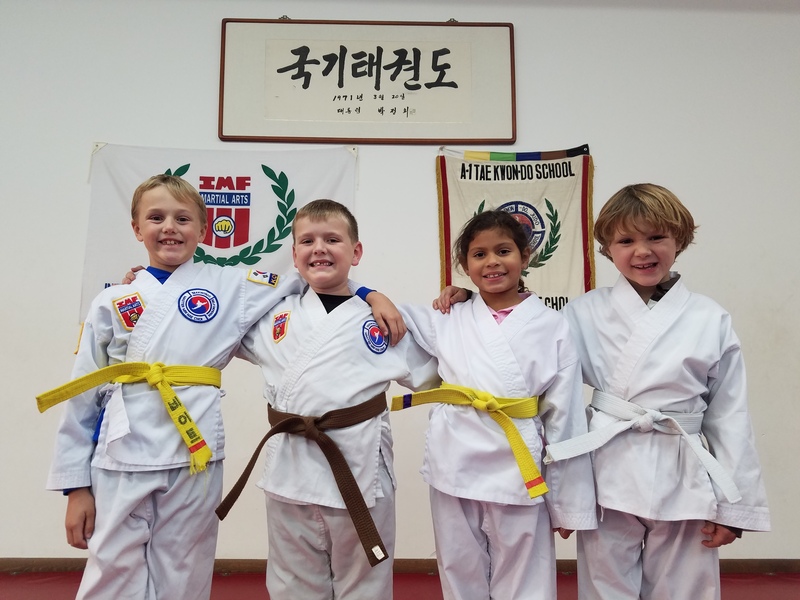 The Choi Martial Arts After School Program is full of healthy and accomplished young martial artists making excellent grades in school. Our kids are developing healthy habits every single day. Doing homework, reading and martial arts training at the same time every day builds the healthy routine and structure children need to become winners in martial arts, and life. Not sure? Here are some benefits of after school programs for kids. Space in the After School Martial Arts Program is limited and often operates on a waiting list to get in. Inquire today to see if we have an opening for your child and pick-up availability at his/her school. The weather may be frightful but never fear! We’re ready for some indoor Halloween Fun this evening! 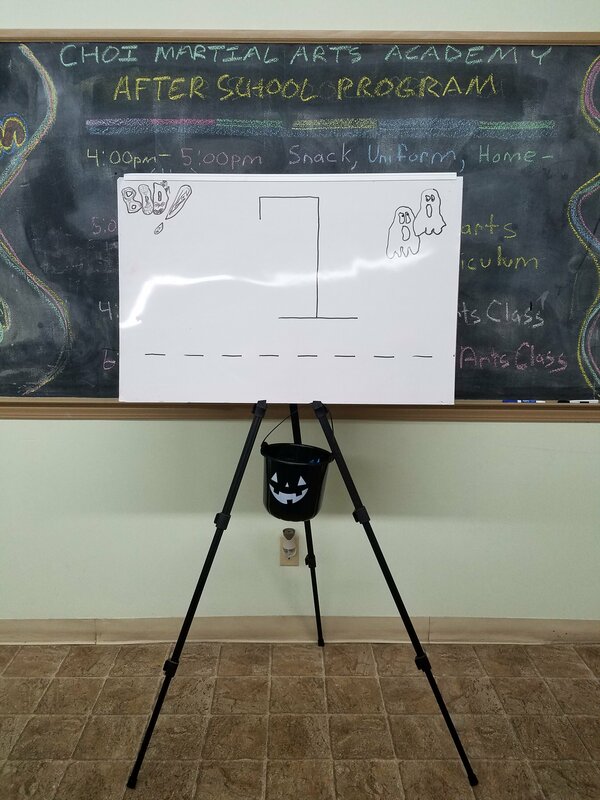 After School Program for Children Halloween Fun! ule. Early Class for Kids is Monday-Thursday from 4:45-5:45pm. Late Class for Kids is Monday-Friday from 6-7pm. Taekwondo is a safe, healthy activity to help your child thrive at home, school and of course in martial arts class! Is your child not earning the grades they should? Is school work becoming a source of tension in your home? 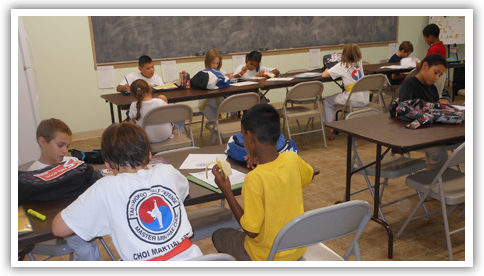 See what a difference the After School Program at Choi Martial Arts Academy can make in your child’s life. We even provide Transport from school! Let’s make this the best school year your child has ever had! 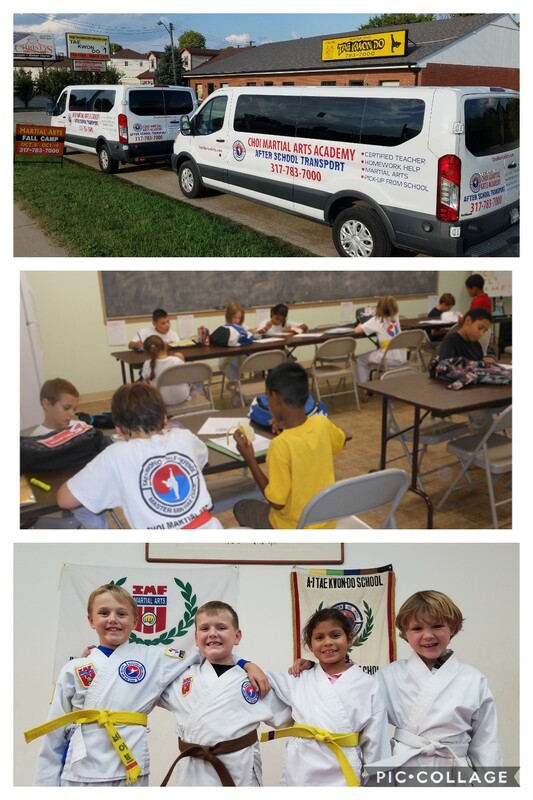 Transported After School Martial Arts and Homework Help! 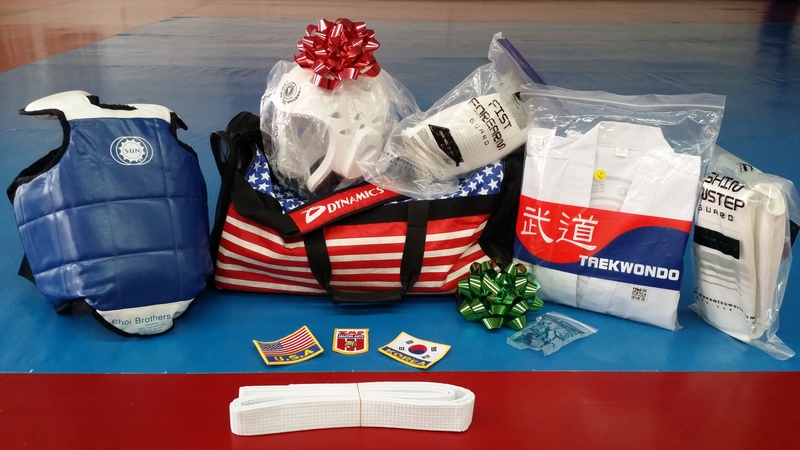 Put this starter package from Choi Martial Arts Academy under the tree for your child this Christmas! While supplies last. You’re invited to a free self defense seminar at Choi Martial Arts Academy Saturday November 21st 12:00pm-2:00pm. The techniques presented in this seminar can be learned quickly by anyone regardless of age, gender or physical ability. Dress in comfortable exercise attire and join us on the mat for a day of fun and learning. 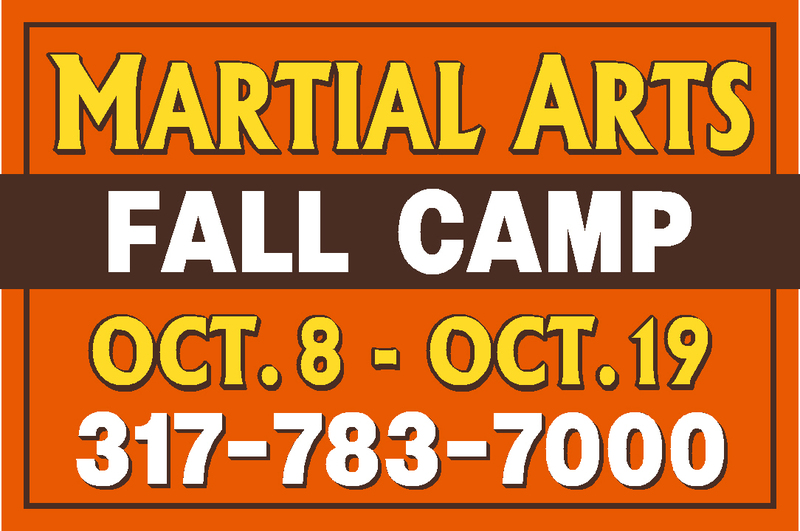 Choi Martial Arts Academy is located in Southport, Indiana 6957 Madison Ave. Indianapolis, IN 46227. Telephone 317-783-7000. 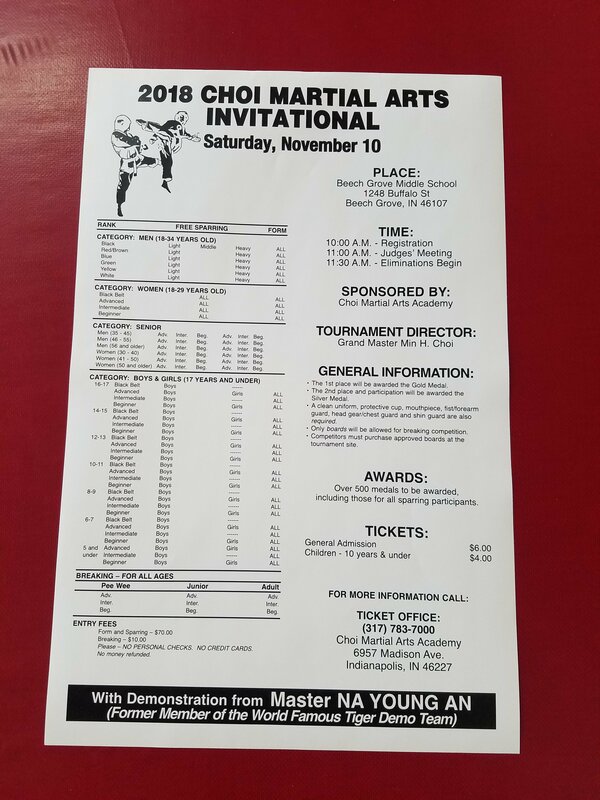 Join us in the spirit of martial arts sportsmanship Saturday, November 7th competitor registration 11am, eliminations begin at 12pm. Center Grove Middle School North 202 N. Morgantown Road Greenwood, Indiana 46142. Tickets available at the door $6 children 10 and under $4. Medals will be awarded for sparring, board breaking and forms. Special demonstration by Master Na Young An 6th Dan Black Belt and former member of the world famous Tiger Demo Team! Call 317-783-7000 for details regarding the tournament. Meet Master Na Young An. Mrs. An is a 6th Dan Taekwondo and Hapkido Instructor at Choi Martial Arts Academy in Indianapolis, Indiana. Master An is a former member of the Korea Tiger Demo Team. She has traveled the world as a professional martial artist.